Cyanide fishing and rising water heat causing the ruins of corals off Bali found hope until a diver inspired by a German scientist's pioneering work on organic architecture facilitated in developing a project now simulated worldwide. In the turquoise waters of Pemuteran off the north coast of Bali where the project was launched in 2000, a metal frame known as "the crab" is covered with huge corals in shimmering colours where hundreds of fish have made their homes. "I was devastated. Basically, all the corals were dead. It was gravel and sand," Rani recalled. But when German architect and marine scientist Wolf Hilbertz told her about a discovery he had made in the 1970s, the diver's ears pricked up. The ensuing electrolysis had provoked a build-up of limestone, in a kind of spontaneous building work. When he tested out his invention in Louisiana in the United States, Hilbertz saw that after a few months oysters progressively covered the whole structure, and colonised the collected limestone. "Biorock is the only method known that protects corals from dying from high temperatures. 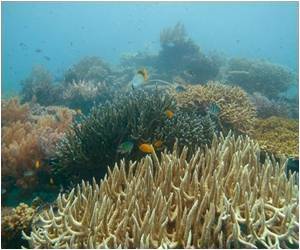 We get from 16-50 times higher survival of corals from severe bleaching," Goreau said. Today he is the diving instructor and manager in charge of the Biorock information centre, located on Pemuteran beach and set up with funds from the sponsorship programme, "Adopt a baby coral". "At the beginning, the fishermen didn't want Biorock because we were trying to stop them fishing. They were saying 'It's my ocean,' but now they see the fish coming back and the tourists coming," said Astika. A new study has determined that though an artificially 'geo-engineered' global sunscreen would lower the planet's temperature by a few degrees, but corals can't be saved that way.